HOW DO YOU write a biography of David Bowie? How do you pin down a grasshopper aesthete whose core belief is that the only thing worse than looking the same twice is sounding the same twice? One day Bowie is a curly-tressed hippie in paisleys and silks, the next a crop-headed proto-punk in denim and leather. One day he is a spiky post-apocalyptic doomster reciting poems about the horrors of late capitalism, the next he is all suits and slick-backed hair declaring that Britain is ripe for a fascist takeover. How to get a handle on him? It is easiest to be sceptical, to see him as an opportunist turncoat whose stylistic changes at once embody and evade the short attention-spans pop notoriously ushered in. More charitably, you can see him as a man of such many and varied talents that he simply cannot stand still. There is something to both these lines of thought, though neither of them gets close to grasping what is most vital about Bowie: his admission, by means of all those about-turns in sound and vision, that pop is essentially vaudevillian. Far from being an expression of down-at-heel authenticity at war with the putatively alienating trivia of tin-pan alley, pop is for Bowie a form not merely compromised—but also defined—by the economic superstructure. Like his painter hero Warhol, Bowie—an art-school dropout who started out in advertising—has always been refreshingly upfront about being on the make. Little wonder that rock critics—late inheritors of romantic individualism all—have been blind to Bowie’s most shocking provocations. By using the mass medium of pop music to undermine the commonsensical idea of the fixed subject in an unchanging relationship with the world external to it, Bowie has done more to subvert the idea of bourgeois individual identity than any number of Althusserian ideologues and Lacanian psycho-semioticians. All of which means that the last thing this guy needs is a biographer who believes that it is still possible to tell a definitive story. Here to prove the point is Paul Trynka, whose life of Bowie, fascinating though it is on the quotidian detail of his young life, doesn’t begin to account for its subject’s potency. Detailed the book is. Everybody knows that David Bowie was born David Robert Jones in Stansfield Road, Brixton, south London, in 1947, but Trynka has actually walked down that road, knocking on doors, tracking down school-friends, and generally painting in the background of a hitherto sketchy story. What emerges from these memories—and rather half-heartedly becomes Trynka’s thesis—is that Bowie is a far more conventional and conservative chap than all that satin and tat suggest. 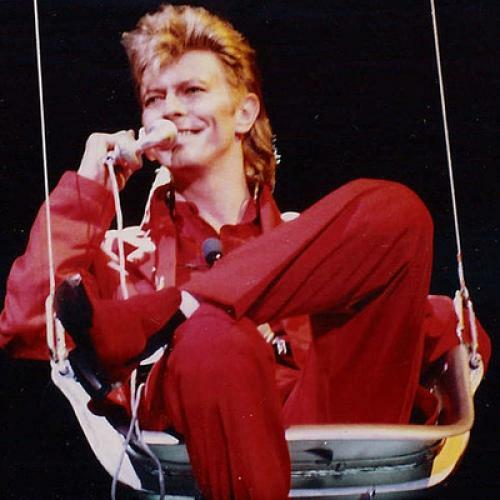 Almost ten years passed between his first joining a band and his finally making it to the top, but there seems little doubt that Bowie accepted the struggle—far longer than the rock and roll average—in the same way that apprentices used to accept their years of low pay as the price of long-term security. “I wish something would happen,” Bowie was fond of saying to his first manager, Ken Pitt, but the fact is that he never trusted luck. One doesn’t have to go along with Trynka’s nonsensical idea that Bowie “forced himself to become talented” to see that here was a young man who understood Edison’s inspiration/perspiration ratio. After teaching himself the basics of composition from The Observer Book of Music, Bowie subsequently did the same with the piano, sitting at it hour after hour, day after day, patiently working out runs and chords and changes. Even when success came he kept on grafting. To read Trynka’s accounts of Bowie’s writing and production activities away from the Ziggy Stardust singles and albums and tours that made his name is to marvel that he had any time for rock and roll’s customary relaxants. Legend has it that by the mid-’70s Bowie was a smack-headed catatonic, but the ambitious work schedule that Trynka documents suggests a mightily controlled habit that was flammed up to worry parents and thereby boost sales. In 1977, when Bowie appeared on a TV show introduced by his ’60s sparring partner Marc Bolan, it was the drug-addled host who fell off the stage and the clean-living guest who ended proceedings with a beaming grin. Alas, such colorful incidents become fewer and further between, as the story approaches the present day. While Trynka fills three hundred pages getting his subject to his thirty-second year, it takes him only another hundred pages to bring things up to date in this, Bowie’s sixty-fourth year. There are several reasons for this narrative diminuendo, but the main ones are Bowie’s increasingly disappointing output and his perhaps concomitant devotion to married life and fatherhood. Since the heart attack that felled him in 2004, he has apparently done little but spend quality time with his wife and their young daughter. There is something reassuring about such domesticity, of course, but it was not for reassurance that anyone ever sought out the young David Bowie. One closes Trynka’s book regretting that both he and his subject didn’t bring things to a halt in, say, 1980. Christopher Bray is the author of Sean Connery: A Biography.